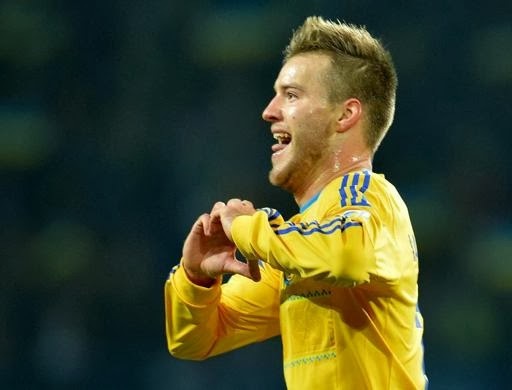 KHARKIV, Ukraine -- A goal by Dynamo Kiev midfielder Andriy Yarmolenko gave Ukraine a 1-0 win over Poland and top spot - at least for an hour -- in their World Cup Group H on Friday. Ukraine's Andriy Yarmolenko celebrates after scoring a goal against Poland. Ukraine have 18 points from nine matches and are two points ahead of England, who were taking on Montenegro in London later on Friday. "It was the match in which the result was much more important than the quality of the play," Ukraine's manager Mikhail Fomenko said. "Luckily, we managed to clinch the win which was so desired and is important for us. "It wasn't our best match in the campaign but we performed solidly in defence and were under pressure when they were seeking the equaliser." Ukraine were ordered to play the match in Kharkiv behind closed doors after several racist incidents in the match with San Marino at Lviv on September 6. The sanctions were suspended as an appeal was lodged, allowing Ukraine to enjoy their fans' support on Friday. Ukraine had midfielders Taras Stepanenko and Edmar cautioned in the opening eight minutes. Poland came close to scoring when Kamil Glik had a 27th-minute header blocked by Evgen Konoplyanka. In the 64th minute, Yarmolenko put the hosts into the lead, sending the ball home past 'keeper Artur Boruc after Poland's Lukasz Szukala misjudged a cross by Konoplyanka. Poland replied with a close-range header from Borussia Dortmund striker Robert Lewandowski which went over the crossbar in the 74th minute.